This week, we are highlighting some of the artists playing the 10th annual Crossroads Music Fest. For more info or ticketing information, please visit cmfkc.com. Madisen Ward & the Mama Bear quietly released their first album, We Burned the Cane Field, in 2012 (recorded/produced by Joel Nanos at Element Recording). It was relatively unknown and received very little press (The Deli KC published a review in 2013). 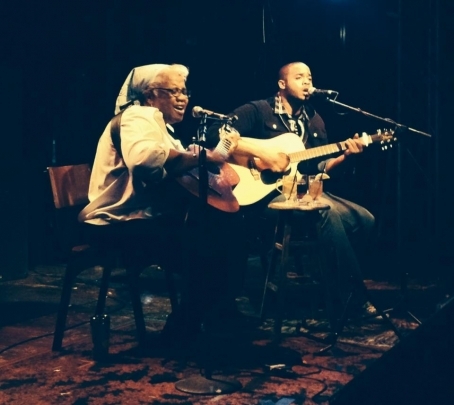 The mother/son duo of Ruth and Madisen Ward continued performing week to week in coffeehouses and smaller venues, gaining a reputation for its profound songwriting, having two intriguing powerhouse voices, and an earnest charm that connected with audiences. Mostly by word of mouth, Madisen and Ruth’s music has captured the attention of many in the KC area and beyond. We talk a bit with Madisen Ward about how the band came to be and what they have planned. The Deli: How would you describe your music in one sentence? Madisen Ward: An organic tribute to imperfection. The Deli: Give us some background on the band. Why did you and your mom decide you would play together? Madisen: We have been a band for 4 years now. My mother started singing at the age of 19; living a semi-nomadic life, singing in coffeehouses throughout the US. I grew up listening to her sing in coffeehouses, never realizing the impact her music and inspirations would have on me in the future. I picked up the guitar in my later teens and started singing even later. After high school, we discovered how much we enjoyed performing together, so I began writing music for both of us to sing in coffeehouses. We've been playing wherever we can, and as much as we can ever since. The Deli: Madisen, what’s it like to be in a band with your mom? And Ruth, what’s it like to work with your son? Madisen: It's a very interesting and unique experience working with my mother. We were already connected as mother and son, so connecting as musicians was a very natural process. Ruth: It's a great experience, and I'm learning a lot from my son while enjoying the process as well. I feel like we're tackling music in ways I never have before. The Deli: Your first album, We Burned the Cane Field, came out in 2012. Do you have any new stuff in the works? Madisen: We have lots of new material. Songs that we're real excited to share with everyone, but the actual recording date is undetermined at this time. We're looking forward to recording as soon as possible! The Deli: What has been your biggest accomplishment as a band? Madisen: We just recently announced that we'll be opening for the legendary B.B. King on October 1 at The Midland (Facebook event page). This is probably our greatest accomplishment so far. It is a humbling honor to share the evening with such an amazing blues icon! The Deli: What does the future hold for Madisen Ward & the Mama Bear? Madisen: Touring and recording is what we're wanting to accomplish for the upcoming months. We just recently signed on with the William Morris Endeavor Agency, and we couldn't be more excited to embark on this journey! Madisen: A couple of Mama Bear's favorite musicians are Tracy Chapman and John Gorka. A couple of mine are Nick Drake and Tom Waits. Kansas City has a very unique and vibrant music scene; we'd rather not pick any one local musician as our favorite. The Deli: Who are you looking forward to seeing at Crossroads Music Fest this year? Madisen: I'm excited to see many bands, including The Philistines whom we're sharing a venue with. Me Like Bees is a band I'm excited to see as well. Madisen: No matter what you pursue; respect others while pursuing it. With all due respect, We're all due respect. Madisen Ward & the Mama Bear will be playing at The Tank Room for Crossroads Music Fest on Saturday. They will be playing at 10:00 pm, right after Maria the Mexican and right before The Philistines.